Tough Summer It has been a very tough summer, with my condition flaring up more frequently, and staying for longer than usual. Hence I haven’t posted a blog for some time and I haven’t been working creatively either. This I have found comes at a cost; when I am ill, is when I need my creativity most. It has a very therapeutic effect as well as giving me a reason to get out and move around. Without it, depression starts to get a foothold and everything becomes harder, both for me and my family. I am at the stage where I know I need to do something about it, hopefully in time, because ignoring it causes it to become all-encompassing and even harder to escape. So I am back at my desk, looking through sketchbooks, old photos and my reference books to see if I can jump start the creative process once again. I did manage to produce one piece of finished work this year, a painting for the Leicestershire and Rutland Wildlife Trusts exhibition at the Guild Hall Leicester, it even got a show on the BBC local news, which is always a boost. The painting, shown here, is called “The last walk of winter”, Lucas Marsh. 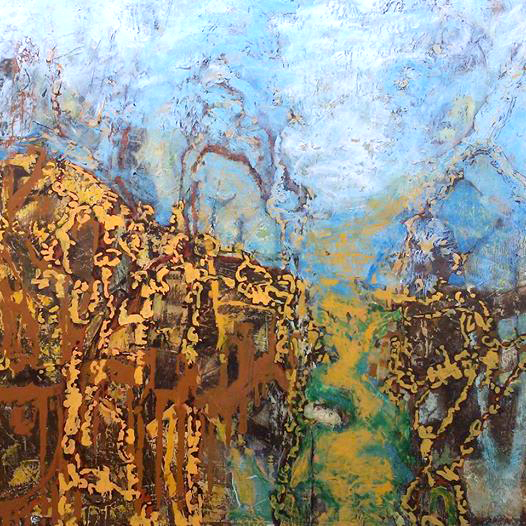 2016 mixed media on canvas 100cm x 80cm As usual, I use the landscape to explore my emotions, and as the title suggests, it was on the last day of winter, with me being optimistic about a change in not only the weather, but in my mood and mobility. Unfortunately winter dragged on a bit in the metaphorical sense, and here I am still trying to shake it off. I have various strategies, and notes; meditations etc to help me in such times, and above all I have my family. Supportive and willing to give a little nudge in the right direction when I let things get on top of me. Hopefully my next post will be soon, and I will have done some work to combat this depression and get back to loving life again. Spring feels very welcome this year, after a spell of immobility, the sunshine has come and as always, it draws me out into the landscape. I am beginning to regain some independence and with it comes the desire to be creative. Photography is always my first outlet, even when my mobility is limited, it still allows me to get out and do something. At the moment, I am taking photos to inform ideas for a painting to hopefully be part of the Leicestershire and Rutland Wildlife Trust Exhibition to celebrate their 60th anniversary. I have been pleased by the accessibility of many of their sites, so even when I am in my wheelchair, I can get out and take photos. I will share the images I create for this later in the year. As for my current project “Chapters”, it feels like I have been stuck at the start line for ages, having not really been able to sustain any period to get my teeth into it, but it is progressing and I am starting to generate ideas and images that I feel are communicating my thoughts pretty well. Attached is an early version of something I am working on digitally. 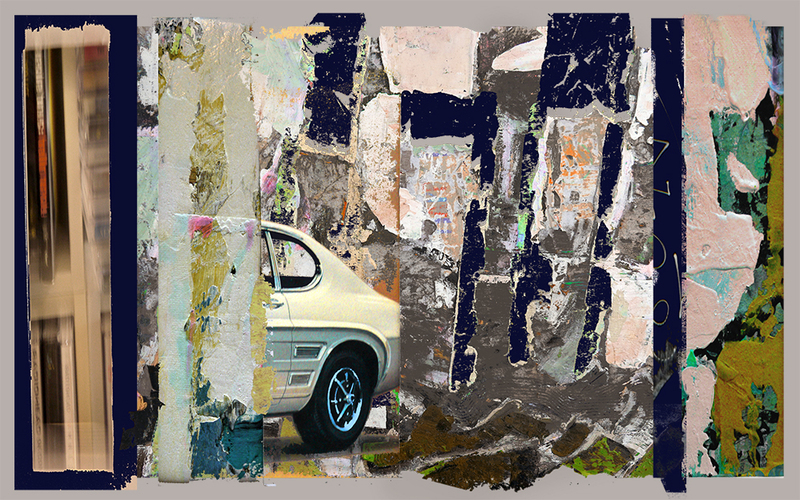 I don’t have a title for it yet but it uses my usual layering of images and the erosion through time ideas. As usual the gestural elements are there to provide the emotional side of things, in a more abstract form that contrast and conflict with the photographs of memorable people and or events/places. As I mentioned in my last Blog, I have been struggling with my new project, and with my health. The combination of which were causing me some anxiety. So I have taken a slight step back, not putting so much pressure on myself, and remembering to allow the therapeutic nature of my creative practice to return. My first trip out for a while was shared with a friend, which always adds to the pleasure of the day, and he showed me some basic video techniques. This was my first attempt at video and I have to say, it was a very relaxing experience whilst out in the sun. I have edited it a bit and placed an audio with it. It uses fragments of sounds from various sources, and it hopefully adds to the abstracted imagery that appears in the video. If anyone would like to view this it is on Youtube, if you search my name or use this link. As far as painting goes, I am progressing with my new ideas but nothing of note has presented itself yet and I am not trying to force it. I have given myself some time off, to produce an image of two just for the fun of it, and “White horse” 2016 is the image shown here. As you can see, it plays with my love of texture and abstract gesture, along with no small dose of metaphor, but it was mostly done just to distract me from a long period of immobility and enjoy the world outside. I am fortunate enough to live in the beautiful south Leicestershire countryside with it’s rolling hills and the Welland valley. It is the first time in ages that I have included figures (human or animal) in an image, I usually focus upon the mood set by the light in the landscape, I hope with this, the figures give a focal point and allow the viewer a “way in” to the work and the other ideas that present. As always, I really appreciate any comments, either about the video or “White horse”. It is difficult starting a new project. Having to develop a new visual language, to communicate new ideas, and when those ideas are connected to your own wellbeing, both physical and mental, it can be very hard to remain emotionally detached from what you are doing. I have felt some anxiety in these early stages of the project. Not knowing what to do is always a bit stressful, but mostly I have been excited and a little frustrated that my condition has flared up, preventing me from working on it at all. Periods of time, days; weeks; months; broken down into significant memories, or as a simple catalogue of good days and bad, happy days with my family or immobile days of isolation and pain, sounds like a melancholy journey of self-pity, and, as someone who battles depression, I acknowledge that it sometimes is just that. However my aim within this project is to openly explore and communicate the multitude of thoughts and emotions, memories and worries that bombard me each and every day. Ever present and ever changing, from one day to another, in some accelerated mid-life crisis, caught on canvas. 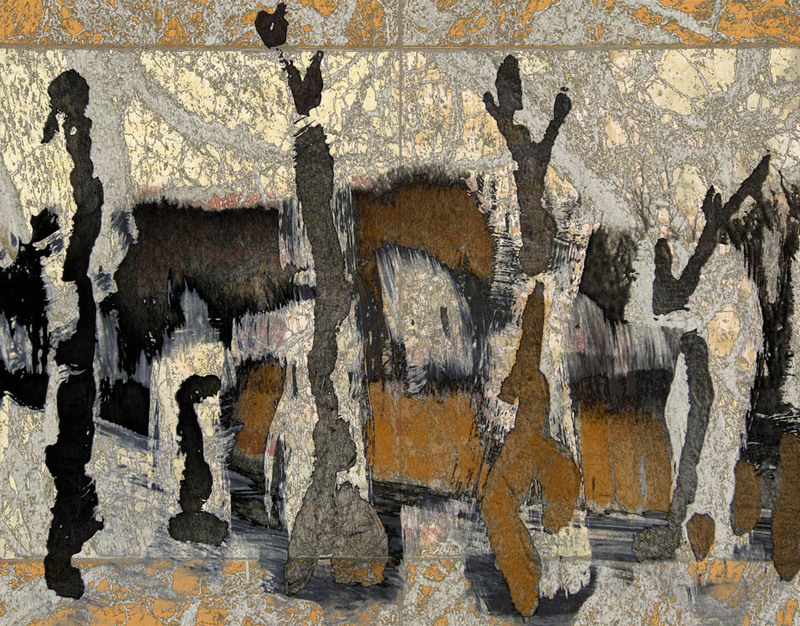 So far, with the sketchbook studies and my digital experiments, it seems apparent to me that some combination of abstract gesture and images in a more representational form ( either painted or photographic), are going to be employed and placed together, the resulting juxtaposition thus becoming the dialogue for my thoughts. It really is early days, and I have had precious little studio time over this winter but it certainly helps to share this process. I have a page on my website dedicated to this new project, and on Facebook I share many of my experimental studies, mostly as a device, to separate myself from the work. The subject is very close to home, but the work that results, is something separate, something else. Detached in the way a word is once spoken, but somehow never fully separated, more like a word spoken in promise or anger. I try not to let it bother me, I certainly don’t need any more anxieties, and showing without expectations definitely helps reduce the stress, but not being able to convey all that I am feeling, remains a frustration. 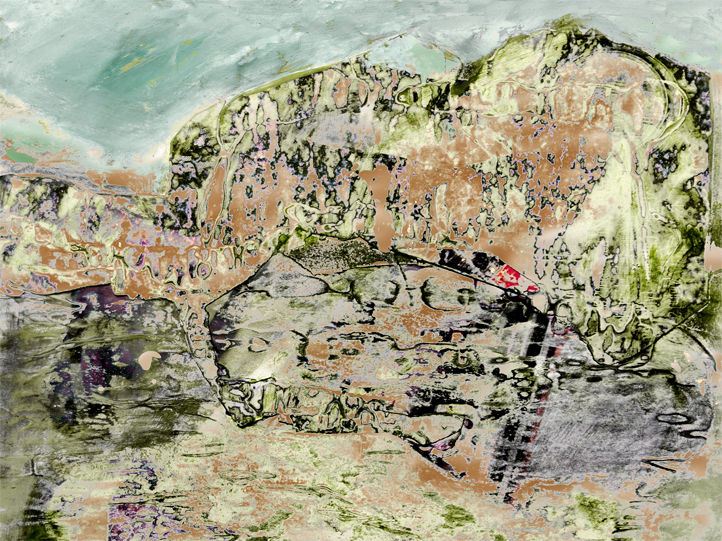 I have chosen a developmental study, part painting, part digital, which shows where I am at. I think it is a first step, giving me a direction and hopefully I will get more time to follow this path so that I can share more in my next blog. With Christmas coming, I have decided to write my blog early as I know it will be a bit mad in the next few weeks. Likewise, I have been working on my artwork in haste, knowing I will get few opportunities during the holiday, and for the past few days, I have noticed my anxieties rising and a familiar dark moody pressure approaching. Luckily nowadays, I am able to identify such low moods as they grow and I am able to put my strategies such as meditation into action. Thinking about why I am feeling stressed (anything on top of my illness can push me over the edge! ), I began to think about the purpose for my art, and beyond that, the purpose for Christmas to a non-religious person such as myself. Although I have worked in Art for decades, right now, as a person struggling with a disability, it’s primary function is to keep me sane. I take my work seriously, but there has to be a balance of therapeutic activity and overwhelming pressure to succeed. I escape into my art in order to take refuge from the day to day, allowing it to become another problem is counterproductive. As too is Christmas. For I see it as a time for family and an opportunity to take a break from the practicalities of daily life. So here I am today, feeling (working hard to feel!) more relaxed about the progress of my work and more relaxed about the weeks ahead. My time in the studio today was more enjoyable and more productive. I continue to explore my new project (see last my blog), looking at memories, interventions that create chapters of my life. This is proving to be a difficult concept to translate into painting; I have been layering and sectioning imagery, attempting to put them into a relationship with time and significance, all without becoming too literal in my visual language. It has made me re-think my processes as an artist, which can only be a good thing, and within my sketchbook and some of my digital studies, some coherent pieces are emerging. I must be patient and work through it and remember to enjoy the process. The image I have shown here is a section of a sketchbook study, the use of bands as “chapters” with the contrasts and interactions of imagery are hopefully showing one direction I could take. Please follow my Facebook page if you would like to see more development of this project. Thank you. It has been an exciting period since my last blog, I have turned 50, had work exhibited in Leeds and Leicester, and began my mentoring programme thanks to DASH. At the same time my work is at a crossroads, I have been looking back, searching for a way forward. It is always interesting to look back at old sketchbooks, especially if you can do it with another creative person. The multitude of options and possible directions that are forgotten, once you take a certain path. The thoughts that are interrupted and broken by choices or events within the creative process are still there, to be re-discovered. My work has always been about memories and time, often about the emotions that such thoughts trigger. But as I searched for a clue that would inform a new direction, I discovered something that had been present all along, but forgotten in my recent practice. 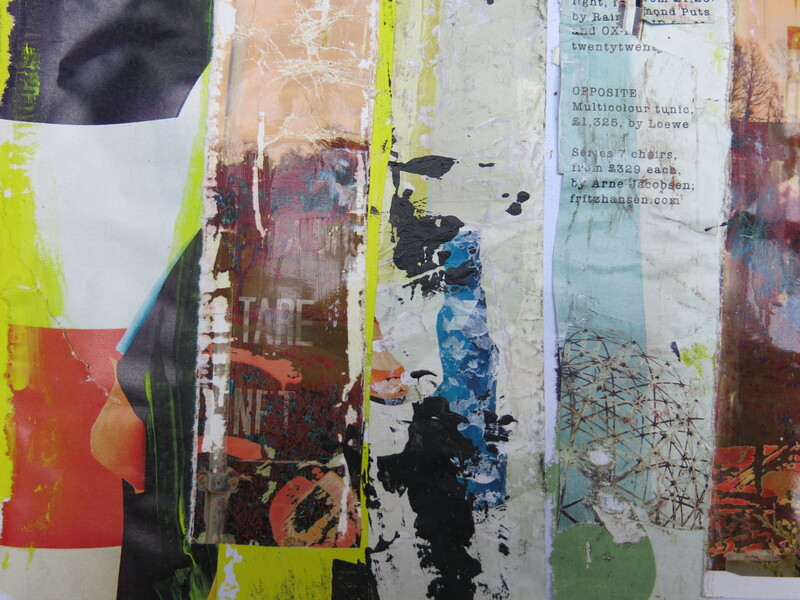 Interruptions or more powerful interventions have been a visible presence in much of my experimental work. In various forms, both figurative and abstract, these anomalies often interrupt a composition or divide a scene. This started me thinking about daily life and my memories of significant events throughout my life; sudden, unexpected interventions that force change, or less significant but more regular interruptions due to fluctuations in my mobility. These events are a major influence in how my life has been shaped; they often feel unwelcome and negative, but looking back, the interruptions often trigger a change that simply would not happen. They break the habits and rituals that would prevent change, forcefully derailing an otherwise predictable journey. Many of my significant memories are related to such interventions. Emotionally charged and challenging, they have initiated the lifestyle changes that have almost always turned out to be positive. Things that at the time, got in the way of my happy, comfortable life; but on reflection, forced me to question and re-invent. So my new direction for my artwork, becomes a return to an oversight in my previous work, exploring time and memories as before, but this time with more awareness of the importance of the unexpected, the uninvited and often random interventions that shape our lives. It’s been a busy and enjoyable summer, having time with family and exploring our beautiful country. All this activity has reduced my art output but I always have a camera with me and usually a sketchbook, pages from which are on my Facebook page. What this time does allow, is more thinking and planning. 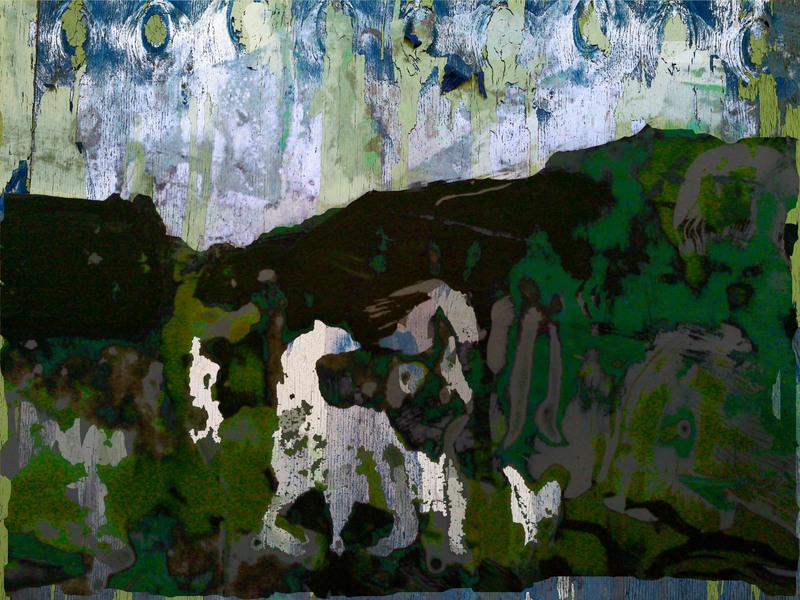 My work of late has been therapeutic and mostly Landscape based, but it was becoming more abstract and expressive, indicating a shift in my conceptual interests. Thinking about people with a disability, or the elderly, and reflecting upon my own emotions as people interact with me when I am in a wheelchair or using crutches, I started to think how much does first impressions inhibit peoples’ perception of an individual? We are all guilt of making snap judgements, but in some cases these initial thoughts may be even more narrowed by the addition of an individual’s age, colour or physical support requirements. What depths are we all missing by relying upon our “first impression”? A discussion that has been debated upon many times. I recently went to a friend’s Open University graduation and I was pleased to see the diversity within the graduates, most or all had needed to fit their study around a busy life, family, work and or disability, and without their gowns and mortice boards, who would have known? So looking for a direction to take future work, I began to think about these “hidden depths” the complexities that make us all unique but which may not be immediately apparent. I love using layers and textures with fragmented imagery, so it seems to fit nicely into my working practice, so this is where I shall start. For the image to go with this blog, I have had to look back through some experimental work, as I have yet to create anything for this new project. 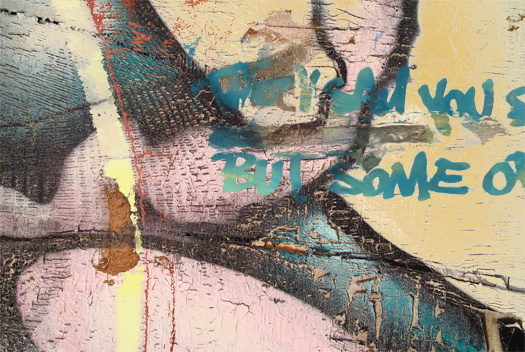 I found a piece called “But some” from 2014, it is ambiguous but suggestive and the inclusion of a section of graffiti text provides a question (and a title), it may well be the thing that starts me off in my new direction. I have been making the most of our changing British weather, although I love a clear sunny day, for artwork purposes, the moody changes can also be exciting. My mobility has been poor for a couple of weeks, so I have been grabbing moments outside, working in my sketchbooks direct from the landscape, rather than the long sessions in my studio. It is always good to return to source as an artist, but I feel this is even more important when your art is used for more than expression. I talk a lot about the therapeutic quality of creating art, but also getting outside, experience nature first hand and embrace the clement and the stormy weather. This is surely a good metaphor for life in general and it’s the reason I love Landscape painting. Turner used the drama of nature to explore the turbulent nature of man, and I believe that our relationship with the seasonal changes is deep and systemic. I use it both as expression and as a holistic management of my mental health, and subsequently, my physical health tends to follow. I have trips and holidays planned to explore our wonderful country, as well as more typical family holidays. No doubt they will take some toll on my energy and mobility, but ultimately the payoff will be enormous for my long term wellbeing. Please fisit my Facebook page, where there are more of my recent sketches. I shall also share some on the DAO Facebook page. As I recover from another spell of immobility and days of migraines, I am reminded of the therapeutic nature of creativity. Even in its memory it helps to maintain some sense of worth and fulfilment, keeping the wolves of depression at bay. I have chosen to show a painting from a current project, one that enables me to travel, see beautiful countryside, take photos and ultimately paint. All of these activities are part of the creative journey that culminates in finished artwork, but more than this, they are activities that give me some quality in my life. The finished article is secondary and I would recommend such actions even to non-creatives. Just getting out there, maybe take some photos: who cares if they are any good or if anyone sees them, on days like today, for me, the memory is enough alongside the knowledge that I will be back out there again soon. This painting from the Lakes is “As the clouds lift over Glenderattera” 2015. We could discuss the work in its artistic, conceptual form, but today I am looking at it just to give me a reminder and a little lift. There are enough good days to make it worthwhile! With the Easter break over, it is the last week of my exhibition at the Landscape Gallery ( still available to view on my website www.alanhopwood.com ) and this has been a period of thinking rather than working. Seeing work together in a show, helps you to understand a collective direction, and it was rather apparent that my work has been moving towards a more abstract language. Driven, I think by an interest in the aesthetics of peeling paint and decay, a desire to be more creative and possibly the fact that I haven’t been out in the landscape much over winter. As a person who has mobility problems, the chances to explore and experience the wonders of this country are a little limited, but when I do get out, the impact upon my state of mind is so positive that it is an effort I am willing to make. And so it would seem for my work, painting in my studio, isolated from external influences, I work away, indulging myself in new techniques and gestures, all the time moving further away from the thing that inspires me, the subject that informs my work and allows me to communicate with an audience through some shared life experiences and recognition. So today I am planning; trips away and days outside, watching the light change, seeing the colours of spring and refreshing both myself and my artwork. I hope to make work that is more about a specific place and day, and how I experienced that as a human being, this may be a beautiful landmark or a backstreet of a city estate, for I still love the diversity of this country and find the same aesthetic pleasure from over-layered graffiti or stripped paint as I do from rolling hills and stormy skies, but with the experience of each place, and the personal effort and resulting pleasure I may feel, I will once again have that specific experience to share. In my previous blogs, I have talked about what drives me to make art, and this comes in many layers. I have already mentioned a love of our diverse country, and of my daily shifting mind set, so now I would like to mention something that is set deep inside me as a person, forged from my upbringing and work experiences; things that have become more significant as a disabled person and artist. When I left school I was lucky enough to get an apprenticeship as a metal worker. A very physical and highly skilled job, building prototype cars. Over the years, I have moved on, going to university to study art etc but the idea of physical work has always stayed with me. I have restored several classic cars, an old boat and a few houses over the years, doing all of the work alongside my wife, working hard and gaining the satisfaction that these projects bring. Now with my disability having a greater impact as the years pass, I find many of these things beyond me (although I still try from time to time, suffering the next day! ). I mention this past, “working class” attitude or work ethic because I believe it remains with me even in my painting. The physicality if much of my work, sanding or scraping away layers of paint are as fundamental as adding colour with a brush. Electric sanders and metal scrapers are part of my artist’s toolkit, and the idea that work should include some effort has stayed with me. This obviously is in some conflict with my disability, but the fact is that I am able, as a disabled artist, I am able to work in a physical medium, exploring ideas of social diversity in both location and employment, and drawing upon my own social migration and physical changes I am able to comment and challenge in my art and my habits. Now having discussed these aspects, I have the bit I always find hardest. Choosing an image that somehow communicates visually what I have been talking about. “Stanage Edge” is a study on paper, I am not sure I would call it a finished work, but it will certainly be used to inform one. It has the specifics of place (Derbyshire), the effort and jubilation experienced; and I hope it also shows the physicality of surface, having been sanded back extensively. It isn’t a large work, which shows my own limitations, but I intend to make some response to it in my studio, working on board so I can add and remove layers as I did in this study. As I mentioned in the last blog, I have a condition that effects my joints and muscles causing varied amounts of pain and fatigue. This meant that each day was unpredictable and limited what I was able to do. I knew that I needed to try to remain mobile, so walking was vital; this is where the interest in photography developed, it made a slow walk much more interesting if I was looking and taking photos. 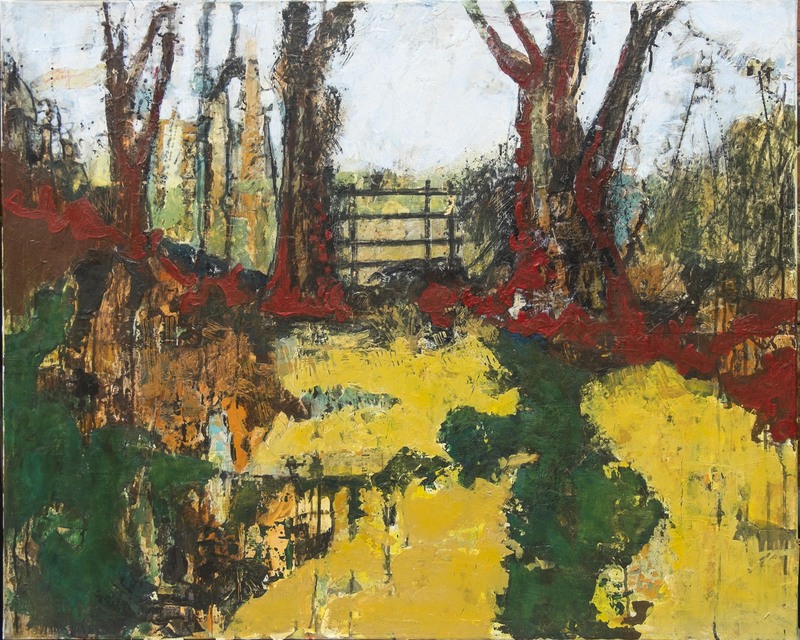 It also had the effect of making me appreciate the changing world from day to day and as trees were becoming a regular subject, it triggered an interest in trees and boundaries. Naturally these subjects began to inform my drawing, and eventually painting, on days when I was unable to paint, I began using digital techniques and this is where a new visual language developed. 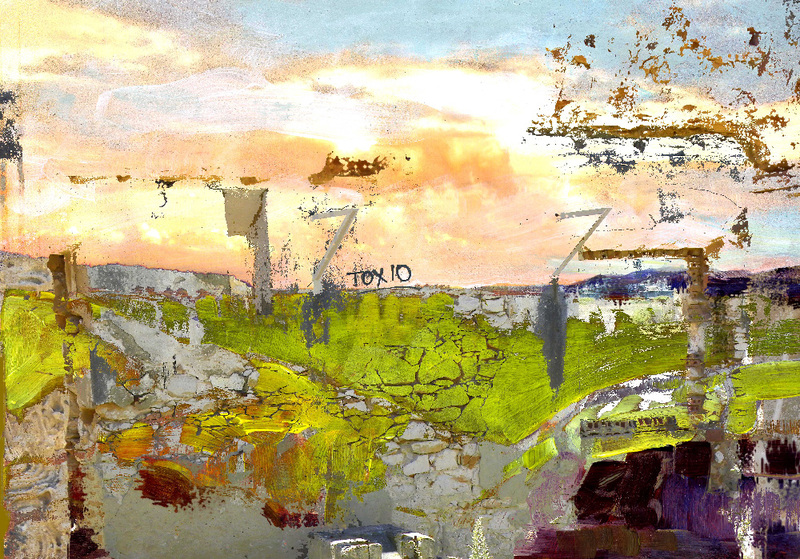 As you can see in this image, I have layered various images to create the desired landscape. 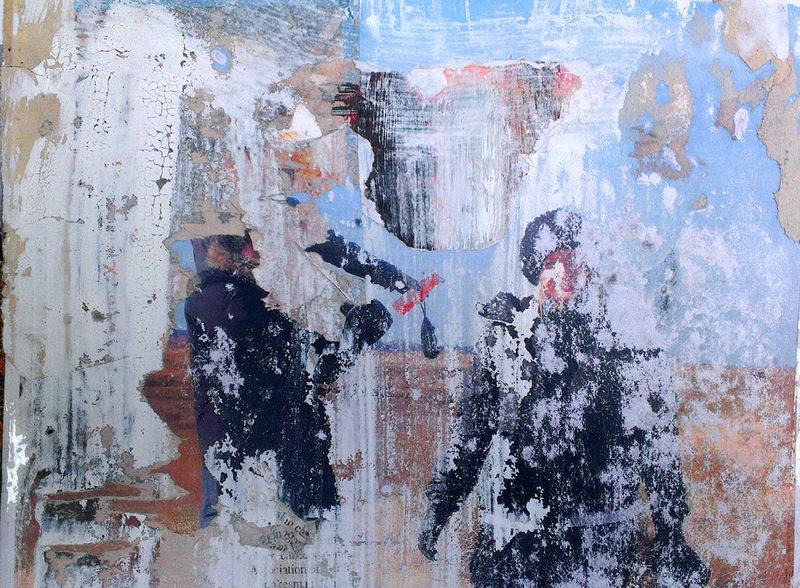 It uses peeling paint, frosted stains on glass and other elements that build up to give the contrast of the picturesque and the decaying that I like to use, hopefully communicating the difference from one day to another, and one outlook to another. For those who are interested in specific techniques, I often paint small images on A4 so that I can scan it; then in Photoshop I make various adjustments and use the blending options in the layer tools, under the Layers menu. I have chosen this image as I think it clearly shows this process. My recent work is more subtle in its uses of digital technique, and I am focussing much more on larger paintings onto canvas; paper or board, these works wait for my more mobile days and I will talk about them in my next blog. Thanks for reading and please leave any comments or questions. I will monitor them as often as I can to reply. As always, if you would like to see more of my work visit www.alanhopwood.com or send me a friend request on Facebook. I am a visual artist who has studied Fine Art at Masters’ Degree level as well as lecturing in Fine art for some 12 years. In 2014, my muscular skeletal condition escalated to such a level that I had to stop work and register myself as disabled. Since then I have been, as we all do, finding a life balance that enables me to manage my condition whilst still having some fulfilment and family life. In the Autumn I was able to find a small space to use as a studio, and now, as and when I am able, I get to paint and be creative, finally doing the thing that I studied for all those years ago. This has proven to be a very positive stage for me, after an initial low after stopping full time work, I have settled into a good routine that allows me to balance my pain levels and still be productive as an artist. I have my first solo exhibition on (until 15th April ’15) at The Landscape Gallery in Market Harborough, and I am taking part in a group show at the Atkins Gallery in Hinckley Leicestershire from the 13th March. I have also just been accepted into the Leicester Society of Artists (LSA) so it has been a busy month. Anyway, that's the score so far, I would rather talk about what informs my painting, both in subject, concept and creation. I use a wide variety of images that explore the diverse outlooks people have across the UK, from picturesque countryside to city streets. 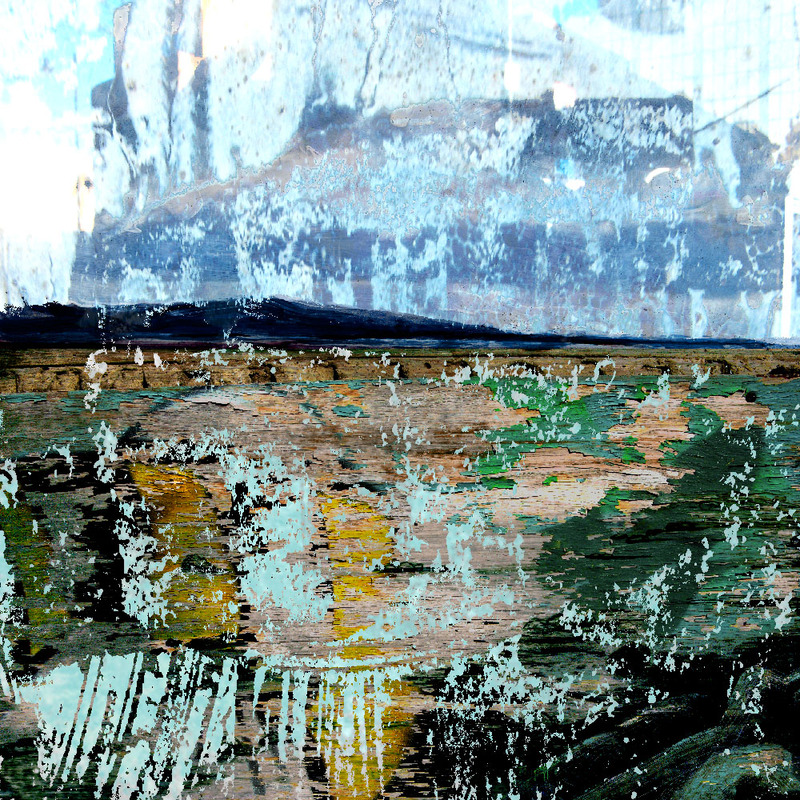 I find aesthetic interest in all sorts of things, and I often use elements of graffiti, peeling paint and litter alongside more traditional landscape subjects. I aim to explore my own emotions through my work and hope that this also engages others and connects to their experiences too. As I have lived in various towns, cities and villages across the UK, my work also celebrates the social and cultural diversity found within our country. "TOXIC" 2013 Digital print stems from conceptual ideas about emotions, and I hope it serves as an introduction into my thought process and visual language. I use traditional painting techniques in mixed media as well as digital manipulation to create the works, sometimes both methods in the same piece. 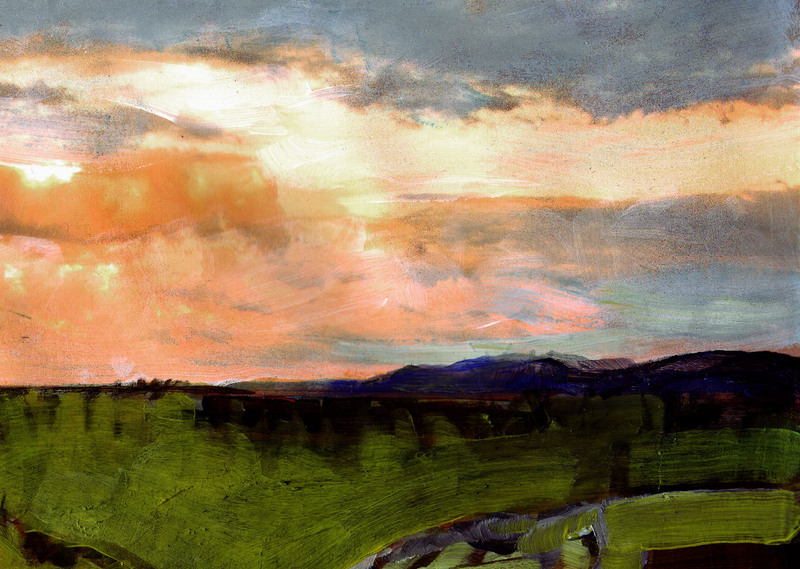 I use subjects direct from nature, such as weather and compositions in observational studies. These are very much in response to a time and place, with a sense of personal experience, captured and held in time, as a memory. In my larger studio works, I explore a more conceptual idea that comes from a combined sense of memory, emotion and perception. 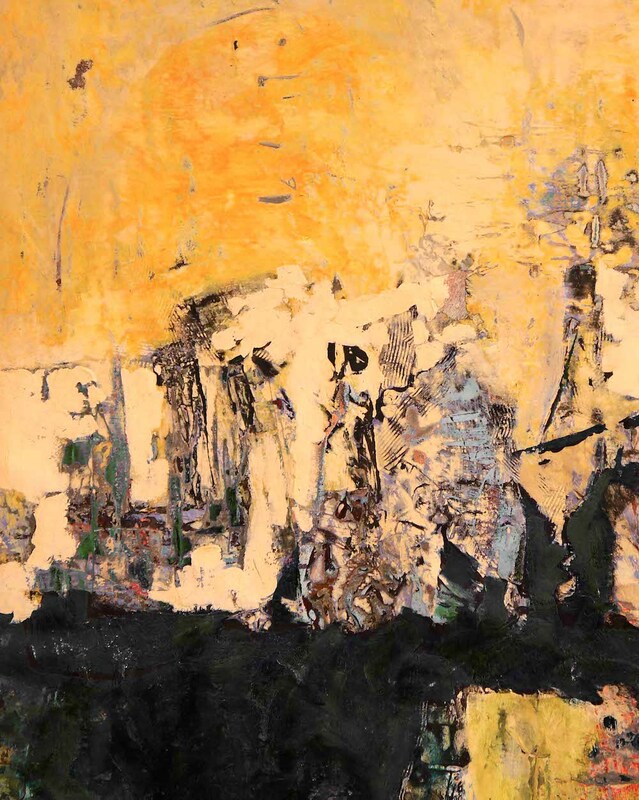 These collective influences are less connected to a specific event and therefore ideas are explored through more abstract processes.